Examples, solutions, videos, worksheets, and activities to help Algebra II students learn about fundamental counting principle. The following figure shows the Fundamental Counting Principle. Scroll down the page for more examples and step by step solutions. Given a set of possible events, we often want to find the number of outcomes that can result. We can do this using the fundamental counting principal. For example, the fundamental counting principal can be used to calculate the number of possible lottery ticket combinations. The fundamental counting principal can be used in day to day life and is encountered often in probability. The fundamental counting principle states that if there are 'm' ways for one event to occur and 'n' ways for another, there are m × n ways for both to occur. 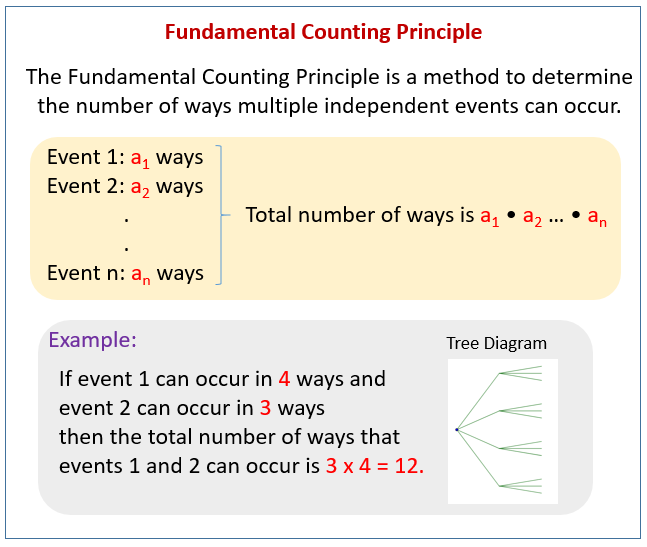 How to use the fundamental counting principle? A sandwich comes with a choice of soda or tea and a side of fries, chips, slaw or salad. Find the number of different combo. An apartment complex offers apartments with four different options, designated by A through D.
How many apartment options are available? Describe two such options. A car model comes in nine colors, with or without air conditioning, with or without sunroof, with or without automatic transmission, and with or without antilock brakes. In how many ways can the ca be ordered with regard to these options. How many different four-letter radio station call letters can letters van be formed if the first letter must be W or K? A social security number contains nine digits, such as 074-66-7795. How many different social security numbers can be formed? How to distinguish between the Sum Counting Principle and the Product Counting Principle? This video demonstrates how to find the total possible number of options for given situations. For example if you have 3 shirts, two pants and 4 hats, how many different outfits can you pick? 1. I have 3 red hats and 2 green hats. If I choose one hat, how many ways can I choose a hat? 2. On a number cube there are 3 even numbers and 1 multiple of five. If you roll the cube, how many ways can you get an even number or a multiple of 5? Jim has 3 pairs of pants, 2 shirts and 2 hats, how many different ways can he dress? Which principle should be used? 1. Jim has a box of coins, it has 200 pennies, 2 nickels, 3 dimes, and 5 quarters. By choosing one coin, how many ways can he get more than 6 cents. 2. MaryBeth has 3 types of bagels in the fridge, 2 types of cream cheeze and 3 veggies. If she wants one of each, how many different lunch options does she have? A fundamental idea to count the number of ways that some event can happen. 1. How many different combinations can be made for a briefcase that has a 3-dial lock with each dial having numbers 0-9 available? 2. How many license plates can be made if the first 3 entries must be letters, followed by 3 numbers? 3. Suppose you take a multiple choice exam that has 10 questions, each question has 5 answers. How many different ways could the exam be answered? How the fundamental counting principle can help you determine the number of possible outcomes or combinations very quickly? 1. You flip a coin and spin the spinner. How many outcomes are possible? 2. You pick a marble and roll a die. How many outcomes are possible? 3. Hunter wants to buy a new pair of skates. He can buy speed skates, figure skates, or hockey skates. A pair of skates can come in blue or silver, and can be decorated with blue streaks or green clovers. How many different combinations can Hunter choose from?